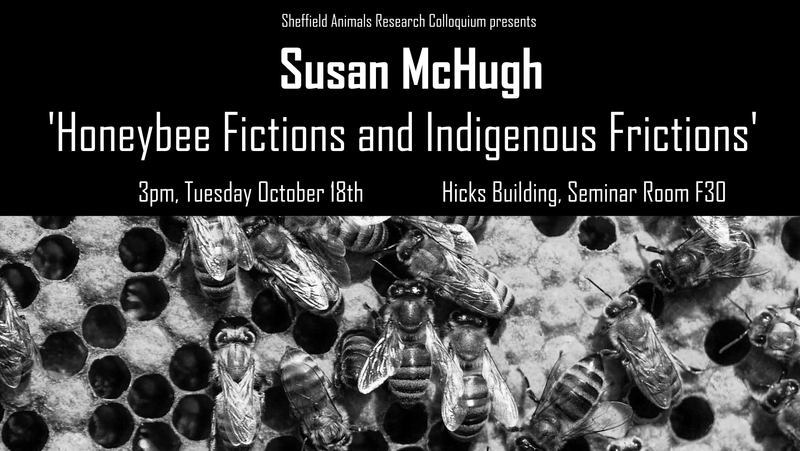 The Sheffield Animals Research Colloquium was delighted and incredibly fortunate to welcome Professor Susan McHugh to speak on ‘Honeybee Fictions and Indigenous Frictions’. The seminar took place at 3pm on Tuesday 18th October 2016 at the University of Sheffield. Prof. McHugh is the author of Animal Stories: Narrating across Species Lines (2011), a volume in the University of Minnesota Press’s Posthumanities series, as well as Dog (2004), a volume in Reaction Books’ groundbreaking Animal series. She has delivered keynote lectures and invited talks in Canada, Germany, New Zealand, Norway, South Africa, Sweden, the UK, and the US. Her ongoing research focuses on the intersections of biological and cultural extinction at the University of New England. Listen to the seminar here – with an introduction from ShARC’s own Dr Robert McKay. Follow the seminar with accompanying presentation slides here.